Successfully Added RD - 601 Smart 3D DLP Mini Projector - DLP Technology, 1080p Support, 1600 Lumen, 3D Support, Android OS, Quad-Core CPU, WiFi to your Shopping Cart. If you are looking for a way to impress your friends, the RD - 601 Smart Mini 3D DLP Projector is the perfect electronic gadget for you. This Android projector supports 3D movies thanks to which you’ll be able to enjoy a true cinematic experience. No longer will there be the need to head out to the theater. With this 3D projector at home, you’ll be able to enjoy all those classic films to their fullest in the comfort of your own living room. Grab some popcorn, sit back, and enjoy stunning visuals with friends and family. By supporting 1080p, you’ll be able to enjoy the latest FHD movies. This Android mini projector is guaranteed to treat you with a stunning visual experience. From now on, you’ll be able to amaze your loved ones during amazing movie nights at home. This 3D projector features an Android operating system. Thanks to this, you’ll be able to use it for so much more than only watching films. With its WiFi support, you’ll be able to browse the web at any time. Additionally, you will be able to use an external game controller to use basic Android applications and games. With its SD card input and USB port, you’ll be able to easily insert external files that can be enjoyed instantly. A powerful 10000mAh battery brings along up to 2 hours of continuous usage time. This is enough to enjoy a full movie from beginning to end without needing to worry about running out of juice. Within its sleek body, this Android projector packs a Quad-Core CPU that supports you while exploring basic Android features. It furthermore comes with the Mali-450 graphic unit which treats you with high detail. The latest DLP technology is furthermore in place for producing deep colors. Thanks to this, you’ll be able to enjoy a vivid visuals whenever you turn on this beautiful Android device. 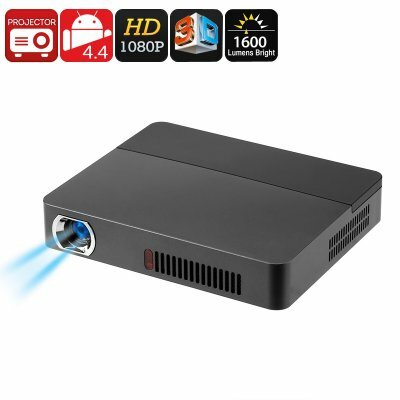 With its 4M projection distance, this 3D projector is perfect to be used in small offices, living rooms, and bedrooms. An 180-Inch projection treats you with a large screen to take the absolute most out of your media. Thanks to its built-in speakers, you’ll be able to enjoy great audio whenever watching your favorite films. The projector itself produces merely 25dB of sound while in use. This means that you can enjoy your media without being disturbed by other noises. With this Android projector at home, you and your loved ones are sure to enjoy hours worth of fun to come. This 3D projector comes with a 12 months warranty, brought to you by the leader in electronic devices as well as wholesale electronic gadgets..